Standard color black. Consult Heyco for other colors. Permit the passage of air for ventilation and heat dissipation. Quick and easy installation with only fingertip pressure. VP-500 through VP-875 have .094" (2,4 mm) diameter vent holes. All other sizes have .125" (3,2 mm) diameter vents. Lock firmly into panel up to .250" (6,4 mm) thick. 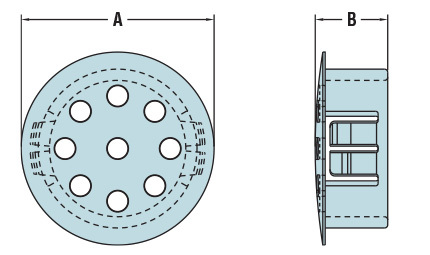 Multiple sizes for use in .500" (12,7 mm) to 4.000" (101,6 mm) diameter holes. Approximate Head Thickness: .062" (1,6 mm). Thickness may vary.